The Invictus Games came into being in 2014 (the same year Manchester had a local-authority led renaissance ‘Bee’ rebrand; an obscure part of the city’s history that was brought back to life) but I can’t help but think of who really benefits? Sure the athletes who take part but what of those hundreds and thousands of more that aren’t capable? Does the viewing audience think about them? The invisible, limbless men too battlefield broken in body and mind to compete? So instead of being the one in however many hundreds equipped with the potential to wrap themselves in the Union Flag on a TV platform podium, they have to wrap themselves in a sleeping bag beneath an underpass and beg strangers; members of the public or a DWP/ATOS bureaucrats for sustenance and shelter, the lack of which has the channeling potential to steer them to the military. #Emotionalise #Irrationalise #Patriotise #Weaponise #Militarise #Mobilise from ‘Sports field to Battlefield & Back: Live. Die. Repeat’ – using #WeaponisedWaterfalls too – as part of the wider orchestrated, “moral degradation of the subject populations“; within the contemporary psychosocial engineering ‘Tragedy Charity Gaslight Ceremony Cycle’. It’s a similar yellow and striped saturation we see on our rolling TV news whenever there is a terrorist attack or a national tragedy like Grenfell; with the vibrant yellow uniforms of lionised “heroism” and “bravery” of the Emergency and Security Services who have repeatedly “ran towards the danger” by rote media soap-script since the first day of Basic Training for the masses, at the start of the emotional Mayhem; the Springtime ‘terrors’ – on Westminster Bridge; the day the ‘yellow association’ theme I’d been tracking since late 2016, finally made sense. “We saw a thick set man in black clothes come through the gates into the New Palace Yard, just below Big Ben. This man had something in his hand; it looked like a stick of some sort. He was challenged by a couple of policemen in yellow jackets. And one of the yellow jacketed policemen fell down. And we could see the man in black moving his arm in a way that suggested he was either stabbing or striking the yellow jacketed policeman”. – Quentin Letts on Sky News. So yes, an emotionalised ‘Matrix’ attempt steeped in a simultaneous Schrodinger ‘State’ of fear & stoic fearlessness, has been underway to get us to subconsciously associate the colour ‘yellow’ with #Emotionalism4Militarism as they clearly are doing with the pervasively-consciously audible and visible viewing pleasure of all things ‘British’ augmented by the ubiquitous product placement of the Union Flag – which has even been extended to ‘food produce propaganda’. 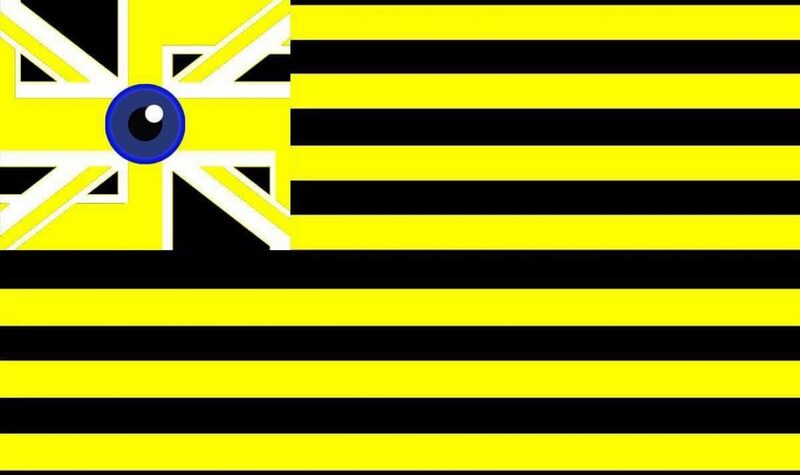 But unlike the consciously-visible red, white & blue Union Flag, this vibrantly-invisible, yellow-subliminal connotation-association seems to have become a ‘coincidental-colour’ as if by untold, untaught false-flag chance happening. By the way, anyone seen the latest Kingsman movie…? …#OpYellowhammer… You quite literally couldn’t make it up. But self-appointed Masters of the Universe could. They did. Gaslighting Gilligan – by Johnny McNeill, was released from Berlin on the 25th June 2017. It is a contemporary, dystopian ‘fiction’ about the intrinsic, interconnectedness of personal & political domestic abuse. It’s ©️ but is a free to download & share from here as a public service.